Andrew Reid Lackey was executed by the state of Alabama on July 25, 2013. Andrew was pronounced dead at 6:25 pm EDT, inside the execution chamber at the Holman Correctional Facility in Atmore, Alabama. Andrew was 29 years of age. He was executed for the murder of 80-year-old World War II veteran Charles Newman on October 31, 2005, inside of his Limestone County home. Andrew, a friend of Charles’ grandson, was robbing Charles because he believe that Charles had a vault containing large amounts of cash and gold. Andrew wanted the money to buy drugs. Andrew graduated from high school and attend Calhoun Community College for two years. Prior to his arrest, Andrew worked as an e-Bay trader. 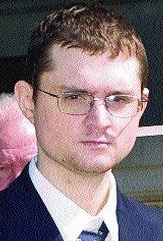 Andrew was a self-described “geek” who enjoyed playing computer games. He had no prior criminal history. Andrew had dropped his appeals and asked the Alabama Supreme Court to scheduled him an execution date. Please pray for peace and healing for the family of Charles Newman. Please pray for the family of Andrew.